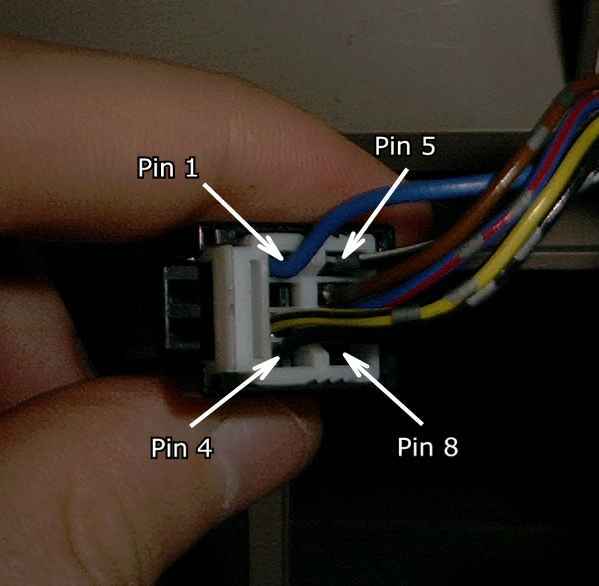 This document describes how to Install and wire the Ford Clock, or the Ford Trip Computer, to an EF/EL Model Falcon. The Trip Computer was fitted to the Fairmont, Fairmont Ghia, Fairlane, LTD, EL GT, and Tickford Fairlane Models. This document also describes how to operate the Trip Computer and its various features. The display is Illuminated when the ignition switch is in the On position. To set the Hours - Depress the Set Button and Hold. Press the Hour Button until correct hours are displayed, then release the Hour and Set Buttons. To Set the Minutes - Depress the Set Button and Hold. Press the Minutes Button until the correct minutes are displayed, then release both the Minutes and Set Button. NOTE : The following functions are only available with the ignition On. Clock Mode - Indicates the current time. This mode will always be entered following ignition On. If the display is other than the Clock Mode, press search until time is displayed in large digits. Month, Day, and am/pm are also displayed. Instant Fuel Economy - This figure may be displayed by pressing the search button until the marker appears next to "INST L/100Km". The figure shown will be fuel consumption in litres per 100 Kilometres applicable at the time of selection. The Display also shows the current time and Date. Trip Fuel Economy - Press the search button until the marker appears next to "AVGE L/100Km". The average fuel consumption since the function was reset, will be displayed in litres per 100 Kilometres. Average Economy can be reset by pressing the Reset button and holding for 1.5 seconds. This will clear the previous averaging data and accept the current "Instant Fuel Economy" Value to begin a new average. Average Speed of Vehicle - This figure may be displayed by pressing the search button until the marker appears next to "AVGE Km/h". 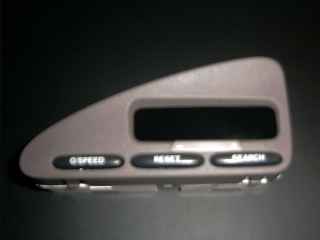 Average speed can be reset by pressing the Reset button and holding for 1.5 seconds. This will clear the previous averaging data and accept the current 'Speed' to begin a new average. Range (Distance to Empty) - This figure may be displayed by pressing the search button until the marker appears next to "RANGE Km". This indicates the expected distance in Kilometres, the vehicle may travel with the remaining fuel left in the petrol tank. NOTE : The Range may vary considerably, depending on driving habits and conditions (e.g. Highway Driving versus caning and driving sideways). Over Speed Alarm - Setting Mode. Allows adjusting a set speed. If armed, then an alarm (3 running notes) will sound when vehicle speed is greater than the set speed. Pressing the O/Speed from the above modes, will display the current set speed, and a circled S symbol. Preset Reset to lower or Search to raise the set speed for the speed alert function. To make the set speed the same as the current vehicle speed, press the Reset, and the Search buttons together, then release both. To arm the alarm, wait 4 seconds. The mode will change to the previous selection, and a circled S will remain on to indicate the Over speed alarm has been set. To Disarm the alarm, momentarily press the O/Speed button. Note : From the above modes, the set speed may be displayed by pressing the O/Speed and Search Buttons together. Releasing both buttons will return to the previous mode. The circled S will flash. To reset the alarm, press the O/Speed button. The display will revert to previous mode. Indicates stop watch time up to 10 Minutes to an accuracy of tenths of a second. You can enter stop watch mode from any of the above modes, by depressing and holding the reset button for a period of 5 seconds, then releasing. To start the timer, press reset. To stop the timer, press reset again. To reset the Timer to zero, press and hold the reset button for a period of 2 seconds, then release. To exit the stop watch mode, press the search button. NOTE : Exiting the stopwatch mode does not reset or stop the timer. If the Range (Distance to empty) reaches 80Km, 40Km, and 20Km, then regardless of the current mode, a warning beeper will sound (3 beeps), and the Fuel range available will be displayed flashing. To reset the alarm, press Reset, and the trip computer will return to the previously displayed mode. There are no further connections that need to be made to connect and Run the Clock. BUT a further 3 wires need to be added, in order for the Trip Computer Module to function correctly. This Means that for EF/EL GLi, Futura, XR6, XR8 models, YOU WILL NEED TO RUN THESE 3 EXTRA WIRES FOR THE TRIP COMPUTER TO FUNCTION ! Pin 1. Instrument Cluster Data Line - This line feeds the Trip computer information regarding Vehicle Speed, Fuel Level, and other information. This Line also "Wakes Up" the Trip Computer when the Ignition is switched to "Acc"
Pin 6. Park Lamp Signal - This signal is a Positive Voltage, (Same wire that is used for the Vehicle Park Lamps). It is used to Illuminate the Buttons, and the side Mode readings on the Trip Computer. Pin 7. Park Lamp Dimmer - This signal is a Negative Voltage signal, and is taken from the Instrument Cluster Illumination Dimmer Switch/BEM. 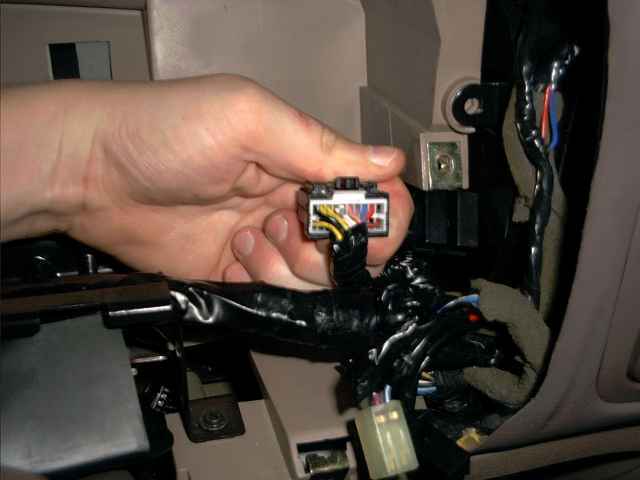 PLEASE NOTE : The following image has been taken from an EF Fairmont, and as such, the wiring for this connector ALREADY HAS THE REQUIRED WIRING FOR THE TRIP COMPUTER ! Pin 2 (White) - !!!! Not Required for the Trip Computer therefore, CUT IF INSTALLING A TRIP COMPUTER !!!! 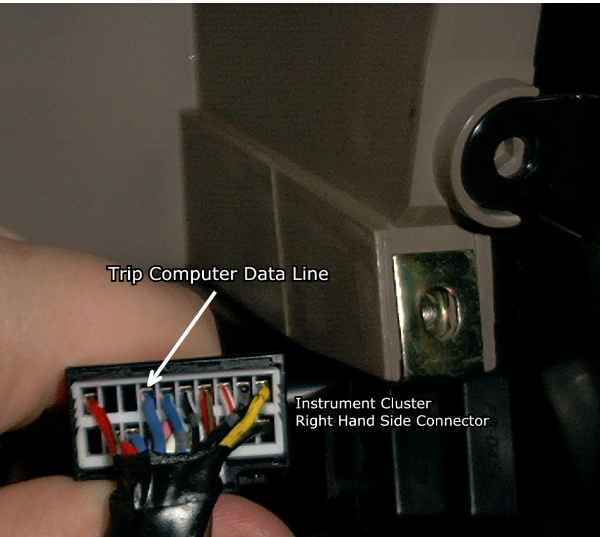 This Line runs from Pin 1. of the Clock/Trip Computer Plug to Pin 14. of the Right Hand Side Instrument Cluster Connector. This line is used to transfer information to and from the Trip Computer, and the Instrument Cluster. This data includes the Vehicle speed, Fuel Level, etc, etc. NOTE : THE ABOVE PICTURE HAS BEEN TAKEN FROM A FAIRMONT, AND AS SUCH IT ALREADY HAS THE TRIP COMPUTER DATA LINE FITTED !!!! THIS LINE WILL BE - M I S S I N G - ON ALL MODELS THAT DO NOT HAVE A TRIP COMPUTER FITTED AS STANDARD !!!!!! THIS MEANS THAT YOU WILL NEED TO PHYSICALLY FIT THIS WIRE, IN ORDER FOR THE TRIP COMPUTER TO FUNCTION !!!!! This Wire is used to Illuminate the O/Speed, Set, and Search Buttons, as well as the side mode indicator. This line can be connected to any Instrument Illumination Bulb, and typically all these lines are coloured Brown. Some suggestions on where to connect this line are either the Illuminated Rear Window Demits tor Button, (Brown Wire), or the Cigarette Lighter Illumination, (Brown Wire). This Wire is used to Dim the Button Illumination for the O/Speed, Set, and Search Buttons, as well as the side mode indicator. This line can be connected to any Instrument Illumination Bulb, and typically all these lines are coloured Dark Blue/ Red. This line cannot be connected to the Cigarette Lighter Illumination, as this Illumination DOES NOT DIM, when the Dimmer switch is operated. If the Digits on the Trip Computer do not Illuminate when the Ignition Switch is switched On, but do Illuminate when the Trip Computer Buttons are depressed, then there is a problem with the Trip Computer Data Line coming from the Instrument Cluster. This is a very common problem when adding the trip computer to a Non-Trip Computer equipped vehicle. This Data Line not only carries information about the vehicle speed, fuel consumption, and fuel level, but also informs the trip computer when the ignition switch is on, and when to "Wake Up"
Ensure that the added line is making electrical contact to the Trip Computer, and the Instrument Cluster. This Does take quite some time to get working 100%, and there is no Easy or quick way of achieving this ! 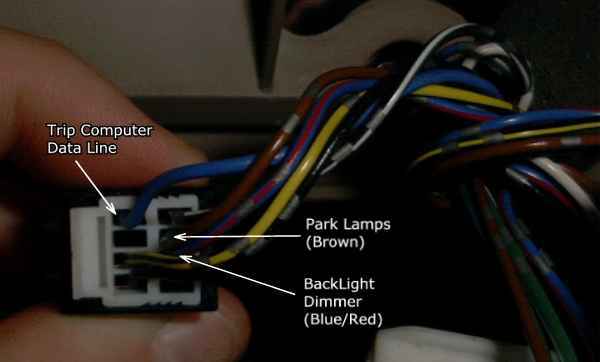 If the Trip Computer Illuminates very dimly, regardless of ignition switch position, or depressing buttons, then there is a problem with the LCD Illumination Bulb. This Bulb is used to Illuminate the Trip Computer LCD Screen, when a button is depressed, or when the Ignition Switch is switched to the "Acc" Position. This Bulb can be purchased from most Petrol Service stations, as well as Ford Spare Parts. If the Trip Computer does not function at all, regardless the Ignition Switch position, and Depressing Buttons, then there is a problem with the Power Line feeding the trip computer. First check the "Radio" Fuse in the cabin Fuse Panel. 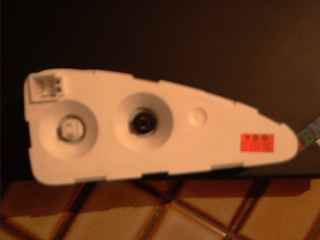 (This fuse is a Red 10Amps Blade Fuse). If this is OK, then check that power is being fed to the Trip Computer connector.